I just bought a 2007 Kawasaki KFX-400. It runs great, but while im riding today I felt that the engine is really hot. The radiator fan is not working. 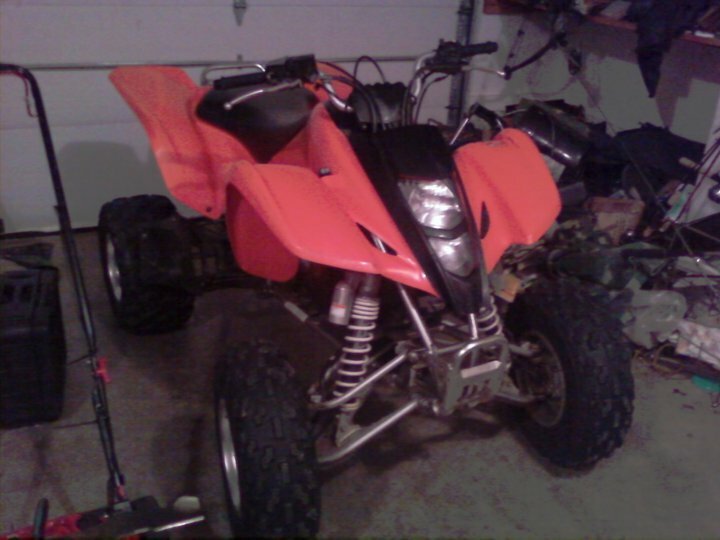 I was wondering if anyone knows anybody with a used one that I could buy or an atv salvage yard. I already took the fan off my atv. Thanks! did you try to hook it up to 12 volts to see if it will work? if it does it could be a thermostat issue maybe or a fuse? I checked the fuse and it was burnt out so I put a new one in and it still doesn't kick on by it self. I hard wired the fan to the battery so it comes on when I start the bike. Is it alright to let it run full time while the bike is running? Or at least until I get a sensor or something. Also is it alright to put water in the radiator like a car. Until I go buy the right stuff? Glad to hear you got it running.........Come out to Perry Lake today if possible!!!!!!!! After I finished the plastics. I used oops from the makers of goo off. Took alot of work, but well worth it!